Our Love Affair with Wunderlist! Love lists? Dread lists? Try this cool tool!! We are on fire about Wunderlist and we just have to share it!! We have known about it for some time and even dabbled with it a bit in the past, but just recently got totally hooked. Because it is available across most devices, we always have our lists with us. We are able to MAP easily. We can share lists with other people through the app or by emailing them. We can also print and carry them around when needed. A feature that we have just begun to use, but are very excited about is Emailing to Wunderlist. You simply forward the email to Wunderlist and it becomes a To Do. The subject is the Task Name and the body of the email gets put into the Notes. Even attachments are included on the To Do. Seriously? Thank you Wunderlist for giving us a way to clean out our inboxes!! We are now running our whole business and our personal lives using this cool tool. Marla loves that it reminds her what to do and when to do it!! Kate loves having one place to dump everything from her brain, then knowing she can access it everywhere she goes. Groceries – with sub categories for each store she shops at. Check out Wunderlist on iTunes and Google Play. Go to the Wunderlist Website to download for other devices. Wunderlist helps millions of people around the world capture their ideas, things to do and places to see. Whether you’re sharing a grocery list with a loved one, working on a project, or planning a vacation, Wunderlist makes it easy to share your lists and collaborate with everyone in your life. Wunderlist instantly syncs between your phone, tablet and computer, so you can access your lists from anywhere. Take a look at the possibilities in the picture below! All of this possible in the FREE version, but they do offer a PAID version with even more options. 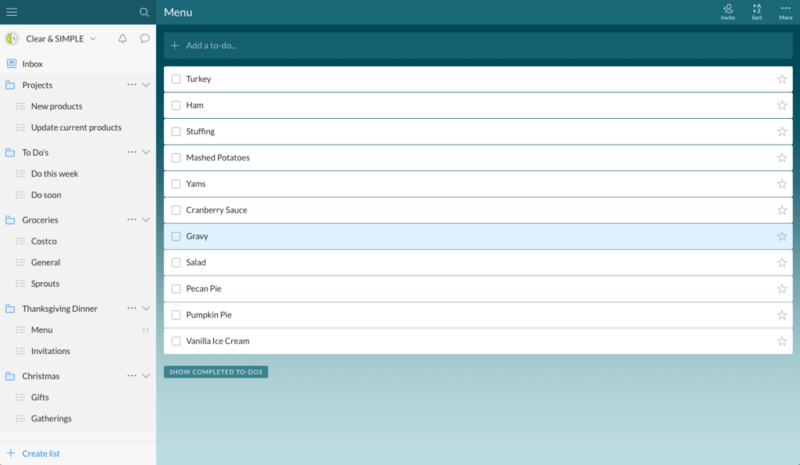 We hope you embrace this fun and simple way to manage your lists! Let us know what you think. Creators of the Clear & SIMPLE Way to get & stay organized! As professional organizers we regularly witness the immense pain, struggle and hopelessness that comes from having too much stuff and not knowing what to do with it. As human beings we’ve also experienced these emotions ourselves. As a society we’ve learned to value things “because they belonged to grandma”, “they’ll be worth something one day”, “because we might need them in the future”, and so on. Our beliefs are now shifting because we are overwhelmed with too much stuff. We no longer believe that anything is worth keeping if it causes us stress, depletes our energy or keeps us from living a good life. We deserve to wake up each day free of stress, smile with a grateful heart for the day ahead, a day filled with what matters most. To get to this point takes practice and shedding layers upon layers; choosing into gratitude; releasing possessions, commitments and energy that no longer serve us; deciding that we really are the masters of our lives and our destinies. If you are ready to begin this process, we invite you to read The ART of Letting Go by our own Marla Dee. All of our clutter tells a story and everyone has their own form of it in some area of their life. Accepting this fact is the beginning. Accepting that your environment is simply a reflection of your life up until now, a reflection of what has happened to you and what is going on inside you is vital. There does not need to be shame or blame in looking at this picture. That would only keep you in the role of a victim. In order to step into the power of change and growth you must be willing to open your eyes and look at it. There is no purpose or healthy payoff in focusing on the clutter itself, on staying locked up in guilt – not for you or for others. However, there is great power in becoming accountable for the fact that you are the creator of your life and of your environment. Your old things, your old patterns, your old relationships reflect who you have been and what you have built or what you have avoided – it is YOUR PAST! Download your FREE copy now to continue reading.